Okay, okay, I must admit...I'm a little Christmas obsessed! But can you blame me? It truly is the most magical time of the year. It's a time to step back and reflect on the greatest gift ever given. The gift of Jesus Christ. So, at the holiday season more than ever, I try to surround myself with those reminders of that gift. I listen to music celebrating the birth of Christ, I read books celebrating the Christmas spirit, and I decorate my home in a way to bring glory to God. Today, I'm excited to share with you a sale that will help you do just that. 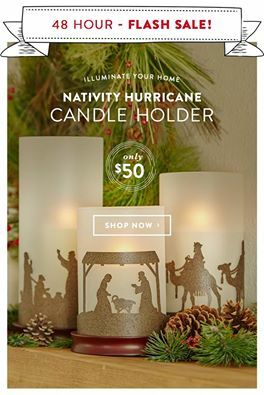 Now through Wednesday night, Dayspring has their stunning Nativity Hurricane Candle Holder Trio on sale for just $50!! That's $30 off of the regular price! This gorgeous set truly is a stunning way to let the light of God shine in your home throughout this holiday season....literally! Don't miss this amazing price- head on over to Dayspring to buy it now! While you're there, you can also take a sneak peek at some of the other stunning Christmas selections at Dayspring this year. They truly have everything you need- no matter your style- to keep Christ at the center of YOUR Christmas this year! Check it out today! Have you checked out Dayspring's Christmas collection? What are your favorite pieces? How else do you keep Christ in your home throughout the holiday season? Oh what cute Christmas decor and gift ideas!!! I love the Joy to the World plank wall art! !